As I have been working mostly on Dynamics 365 portals, here goes another D365 portal post. The additional details are like. Additional internal communications among the internal team regarding the loan request. So here is the set-up. 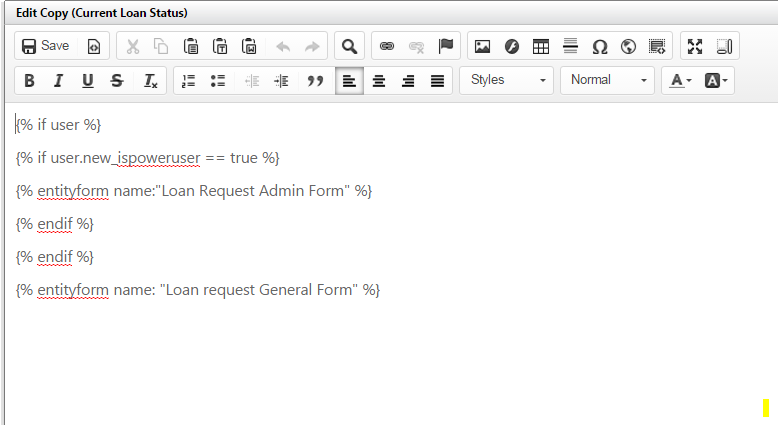 In the portal there is loan request web-page, which depending on the logged in-user, renders the Admin form. To determine whether the portal user is a Power User or not, there is a field on the contact entity – “Is Power User” which need to be set. Below is the screenshot for the same. Creating a loan request entity and then showing it up for the demo would take lot of time and also can’t use the screens from the client system due to legal issues. So here I would basically show you with the account entity, how you can dynamically render a entity form based on condition using Liquid. As you can see, I have created a Web Page with template as Blank Page. Notice carefully that I have not set any entity form or entity list. This is because I am going to set those up dynamically depending on conditions. Now login to the portals as admin contact and then include this web page in the Navigation. Clicking on Loan Status gives an empty page because we are using the blank page template. Now to mock up the previous scenario, I have created two forms for account entity. Create Two entity Forms in CRM based on these two forms. 3. Set up the forms Dynamically using Liquid. Login to the portal using the admin contact and edit the Copy content of the Loan Status Page. Enter the below Liquid Code in the editor. Save it and now when you refresh the page, you would see the power user is able to see both the forms. Using the same construct, you render forms dynamically based on business conditions.